What Coverbind binding spine size do I need? 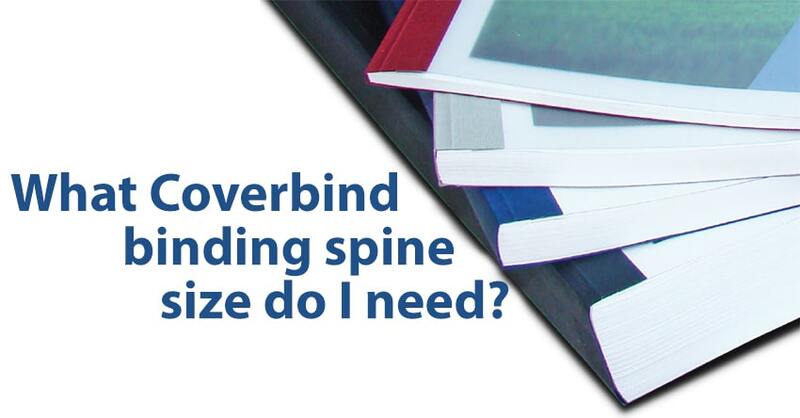 Depending on the thickness of materials you are binding, you will want to use a different Coverbind binding spine size. It is important that you use the Coverbind size selector on your machine to help determine the best fit for your document thickness for a couple of reasons: 1) sheet capacity is always going to vary depending on the paper stock or paper thickness that is being bound (a book made with basic 20 lb. copy paper will have more sheets than one with a 50 lb., but may be the same thickness), and 2) if a spine is too small for your book, the bind will not be as strong as it should, as the glue will not have room to fully saturate the sheets. This is a general capacity chart that is accurate for all different kinds of Coverbind thermal binding covers, so whether you are using any of the many soft covers or hard covers available, you can use these general rules of thumb to get the perfect spine size for your book thickness. Remember not to over-stuff your covers; this prevents the glue from fully saturating the sheets and will compromise the bind integrity.